I made it through one short year of Brownies, just enough time to get a few of those cool pins on my sash and wear the beanie with non-committal pride. In college, I passed on sorority life and skipped the dorms. Today, I love league tennis because I can play an individual match to contribute to the team’s win or loss. For better or for worse, I own my score. And I get to wear a cute skirt. So how is it that this club dodger has been a member of AIGA Colorado since 1994? I’m a thinker and a designer: Party of one, but connected to many. Designers need to think a little sideways; it’s what makes us valuable. The much-aligned “box” doesn’t enter our picture. It’s hanging out with “paradigm shifts” and “push back” at a chain restaurant sipping Mai Tais. We don’t draw straight lines or color outside of them; we doodle… and think… and suppose. And we prefer circles anyway. We question all things and turn conventional ideas on their heads. Which is precisely what AIGA National has done, and this is why I’m back on the board. When I was the AIGA CO Communications Director in the mid 90s, National was king of the court. It seemed to me at the time that this authority figure (to be questioned) was taking and not giving a whole lot in return. But that started to change with the leadership of Ric Grefé. All of a sudden, we got a design annual and we got advocacy. We got a salary survey to help us gain proper compensation, very important in a smaller market. Flawed voting ballots were being redesigned … by designers, of all people! Designers were gaining a place at the table among national discussions that impacted lives. Heck, we were preserving freedom, the foundation of our country’s beliefs. Design was Important. This was exciting. I was Inspired. National did what I respected most: it turned convention upside down. Growth came about and respect followed. Our chapter and our profession has benefited greatly. (Apple didn’t hurt us much either.) Many entities coverged to show people the power of design and design thinking — how it transforms behavior and shapes society. To me, AIGA offers a safe haven for the non-followers, the anti-joiners and the “does it have to be a light bulb?” people. The guerrilla crafter. The master of Legos. 23,000 of us nationwide. We are all very different from each other, but form a group that “gets” it. Gets me. You design icons in the shower. Yep. Go for the pricier option because the color is so good. Uh huh. Know the keyboard short cut for “go to page _”. (That one is the same in InDesign as it was in Quark.) Have the coolest laptop bag at the client meeting. Of course. Geek out over apps that play thunderstorm sounds, complete with lighting flashes (optional). Naturally. Date via an app that only works on an iPhone. No judgment. All of a sudden, it was feeling good to belong. Sure, joining and seeing a speaker or two is one thing. I’d even volunteered some designs over the years for events. But how did I end up not only back on the board but as leader of the misfits? Some say I was Syriac’d*. But the real reason is because it was time to step up. After 19 years of membership and a few years on the board early on, I wanted back in. All in. Because I believe in karma … my karma is PMS 610 (I checked). What you put forth is what you gain back. Push me, pull you. Celebrating 15 years of EnZed Design on Leap Day last year, I felt it was time to refresh and renew my passion for design. And then, by some sort of divine design, this opportunity came along. I encourage you to follow my lead. The new membership levels ($50, $150, $250) make AIGA accessible to all designers — from student to seasoned pro — and for anyone who values design too. With 500+ Colorado members, 30+ local events per year, and dynamic national conferences and online resources, you’ll be in good company. Good design company. If you’re still not up for following the herd, lead it. Volunteer to be a Chair or run a special program, or just come out once in a while between life and deadlines to learn something new or share more than a post. Join for the benes and the beers. Pick your level and get involved. In tennis, even if a ball is 99% out, it’s still in. I’m a designer and an AIGA member because I’m an individual who questions the norm and plays well with others. AIGA fits me perfectly. Or misfits me splendidly. I drank the Kool-Aid and I’m OK with it. 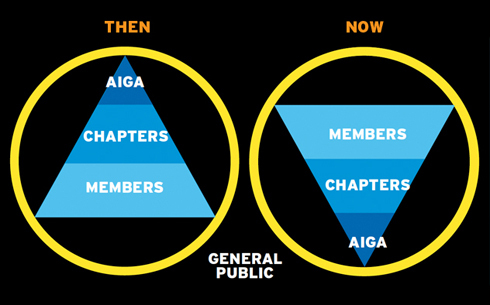 For an in-depth look at the future direction of AIGA and how you can contribute to the discussion, read this AIGA Insight. What a nice post. I already belong to AIGA (DC) but this makes me want to buy a second membership just for the heck of it. Thanks for sharing your thoughts, Helen. Great article Helen! So glad you’re back in a leadership role. Nothing wrong with a repeat offender – I should know :)) Exciting stuff.